STAR WARS AFICIONADO WEBSITE: 'STAR WARS' AT 40: BATTLE BEYOND THE DEATH STAR! The classic 1977 image soon used for marketing/promotion for STAR WARS which we all wish had been in the film- (we assume Luke's) X-wing fighter bearing down on Darth Vader's unique ship, with the Death Star lurking in the background. 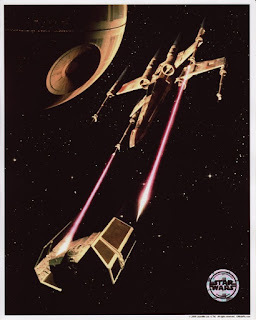 With very few optical shot frames available for publicity by the film's release, this was a special composite image by Richard Edlund and ILM, with laser fire airbrushed on by Ralph McQuarrie. Truly a magical and exciting shot, I remember it being used effectively by Letraset UK stationery for 1978 ring binders, whilst Stateside as the very special cover for American Cinematographer magazine, for whom it was first conceived.